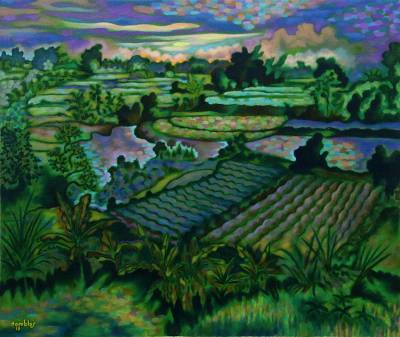 Impressionist Painting of a Balinese Beach, "Landscape in Siyut Beach"
Capturing the tranquil beauty of the rice paddies near Siyut Beach, Balinese artist Nyoman Tomblos paints this wonderful composition. He works in an impressionist style, using dabs of green and purple to give the painting a dreamlike aesthetic. The setting sun is hidden by distant clouds, filling the sky with hues of yellow and purple.